Paul gave an excellent illustration to the believers in Corinth (1 Corinthians 12:12-27), where the church is to be “One Body with Many Members” and act as God’s ambassadors to this fallen world. The true believers are the church and as such we are to be doing the things that Jesus Christ would do as if He were here physically on the earth. The church is to be a Christ-like and Christ-following group of believers that are witnesses of Him to people that are lost. Throughout the New Testament, we see spiritual leaders teaching others. This is part of the Christian lifestyle; it is part of the Great Commission. “Go and make disciples of all nations…teaching them to obey everything I have commanded you” (Matthew 28:19-20). The church is an educational institution as well as a place of worship and transformation. To Guard the Accurate Teachings of the Church – “You then, my son, be strong in the grace that is in Christ Jesus. And the things you have heard me say in the presence of many witnesses entrust to reliable people who will also be qualified to teach others” (2 Timothy 2:1-2). To Discipline Believers – “And if your brother sins, go and reprove him in private; if he listens to you, you have won your brother. But if he does not listen to you, take one or two more with you, so that by the mouth of two or three witnesses every fact may be confirmed. And if he refuses to listen to them, tell it to the church; and if he refuses to listen even to the church, let him be to you as a Gentile and a tax-gatherer” (Matthew 18:15-17). To Become More Like Christ – “But, speaking the truth in love, may grow up in all things into Him who is the head—Christ— from whom the whole body, joined and knit together by what every joint supplies, according to the effective working by which every part does its share, causes growth of the body for the edifying of itself in love.” (Ephesians 4:15-16). To be Taught by Spiritually Mature Teachers – “To the elders among you, I appeal as a fellow elder and a witness of Christ’s sufferings who also will share in the glory to be revealed: Be shepherds of God’s flock that is under your care, watching over them—not because you must, but because you are willing, as God wants you to be; not pursuing dishonest gain, but eager to serve; not lording it over those entrusted to you, but being examples to the flock” (1 Peter 5:1-3). “Likewise, older women should be reverent in behavior, …and teachers of good things, that they may teach the young women to love their husbands, to love their children, and to be self-controlled, pure, homemakers, good, obedient to their own husbands, that the word of God may not be dishonored” (Titus 2:3-5). Christians need to be diligent in teaching all children to love God with all their heart soul and might and to tell them about God every chance they get. In addition, as their parents you should also tell them about God’s love when they go to sleep and when they rise up (Deuteronomy 6:5-7). Both children and adults should be saturated with God’s Holy Word. To be Unified in Christ – “There is neither Jew nor Greek, there is neither slave nor free man, there is neither male nor female; for you are all one in Christ Jesus” (Galatians 3:28). To get People Together to Praise their Savior – 1 Peter 2:9 declares that: “we are a chosen people, a royal priesthood, a holy nation, God’s special possession, that you may declare the praises of him who called you out of darkness into his wonderful light.” And we are to “Speak to one another with psalms, hymns and spiritual songs” (Ephesians 5:19). 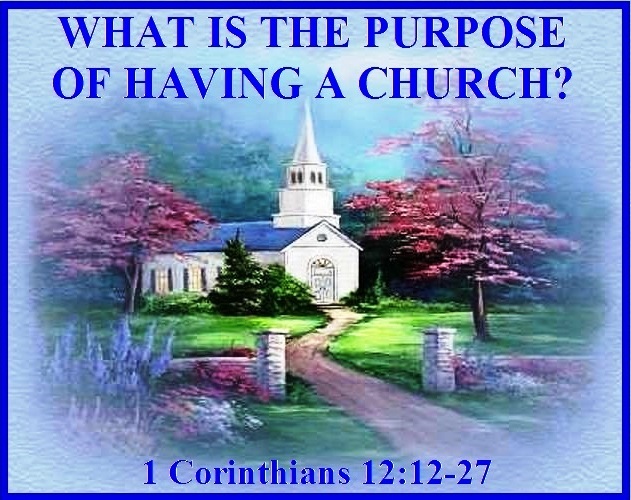 The Church has the Purpose – “For the equipping of the saints, for the work of service, and for the building up of the body of Christ, until we all come into the unity of the faith and of the knowledge of the Son of God, into a complete man, to the measure of the stature of the fullness of Christ (Ephesians 4:12-13). God provides leaders who have the function of preparing others for their godly mission. The result is growth, maturity and unity, if we allow the process to work as God intends. To summarize, the true church is the body of Christ, made holy by the indwelling of the Holy Spirit. It is manifested on earth in local gatherings of the body of Christ, and it is also enthroned with Christ in heaven (Ephesians 2:6). By God’s own appointment, it is distinct from other institutions by being holy and by being uniquely empowered by the Holy Spirit to accomplish God’s will for its role in disciplining and encouraging believers. We need to understand that the church exists because God wants it for His purpose now and for eternity.